SAT programs in India and across the world are administered through International Representatives of ETS (Educational Testing Services), United States. SAT Reasoning Test measures the critical thinking skills that a student requires for academic success in college. SAT reasoning test assesses the analytical and problem solving skills of an aspirant. Each section of the SAT Reasoning Test is scored on a level of 200—800, with two writing sub scores for multiple-choice and the essay. 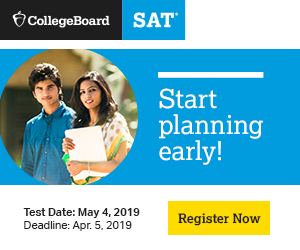 SAT Test (SAT Reasoning Test formerly SAT I) includes critical reading, mathematics and writing section, with a specific number of questions related to content. Critical reading section includes short reading passages along with the long reading passages. (SAT Reasoning Test) Mathematics Section includes questions from exponential growth, absolute value, functional notation and places greater emphasis on topics like linear functions, manipulations with exponents and properties of tangent lines. Important skills formerly measured in the quantitative comparison format, such as estimation and number sense, are measured through the multiple choice and student response (grid-in) questions. Multiple Choice and student response (grid-in) question are generally asked from estimation and number senses, etc. Use of Calculator: Students can use a four-function, scientific or graphical calculator. The College Board recommends that students use a calculator at least at the scientific level for the SAT, although it's still possible to solve every question without a calculator. Questions in this section are Objective Type containing 5 responses to choose from. Questions of this type have no answer choices provided. Instead, students have to solve the problem and fill in the answer on a special grid. Ten questions in the test are of this type. The writing section includes both multiple-choice questions and a direct writing measure in the form of an essay. Short Essay measures the ability to (a) organise and express ideas clearly (b) develop and support the main idea, (c) use appropriate word choice and sentence structure. Student are asked to develop a point of view on an issue, using reasoning and evidence based on experiences, readings and observations. Multiple choice writing questions measure ability to (a) improve sentences and paragraphs, (b) identify errors such as diction, grammar, sentence construction, subject-verb agreement, proper word usage and wordiness. SAT Subject Tests (formerly SAT II: Subject Tests) are designed to measure the applicants knowledge and skills in particular subject areas like English, history, mathematics, science and language. The subject tests are designed to test the ability of an applicant to apply the knowledge that he / she has acquired during school education (high school or equivalent of US education etc. / 12 years of schooling from any Indian board / University). do not match any particular textbook or method of instruction. The tests' content evolves to reflect up to date trends in high school curriculum or 10 + 2 school curriculum, but the types of questions vary a bit from year to year. Several colleges use the Subject Tests like English, history, mathematics, science and language for admission, for course placement and to advise students about course selection. SAT subject tests are used in amalgamation with other background information (e.g. high school i.e. 10+2 record, scores from other tests like the SAT Reasoning Test, teacher recommendations, etc.). These tests provide a dependable measure of candidate’s academic triumph and are a good forward planner of the future performance. Some colleges specify the Subject Tests they require for admission or placement; others give the free hand to the applicants to choose which tests to take. The listening tests include: Chinese, French, German, Japanese, Korean and Spanish. Candidate must carry a portable CD player with earphones to the test center. All listening tests are offered during the November month of SAT admission at designated test centers.